3. Rockin Around The Christmas Tree! The Jingle Belles with the Rockettes! The Jingle Belles with Tony Walton! 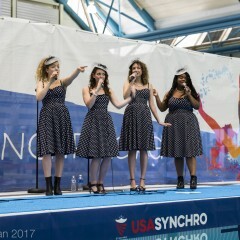 The New York Belles (The Wedding Belles/The Jingle Belles) are a premiere female acapella quartet from New York, New Jersey, Brooklyn and the Bronx. The New York Belles provide modern, festive, and fun performances to many venues each year. If you're looking for some fun acapella entertainment we would love to come sing for you! We are available for Christmas singing, wedding proposals, cocktail hours, birthday parties, corporate events, singing telegrams and more! Please contact Eden for inquiries and booking 516-314-9002. These girls are so very talented!! I booked them to sing for my fiance and I when I proposed. They were very quick to respond to my request, and even learned the song that I wanted them to sing. They did a great job keeping me informed of their progress, and on the day of my proposal helped to work out a plan that really took my girlfriend by surprise! Having them sing for us really made my proposal something extra special and unique. I would definitely recommend them to anyone looking for an acapella group for any occasion. My Guests & Honoree LOVED It! I was not able to attend but I heard it was fabulous. Perfect to get people into the holiday spirit! The group was professional and very easy to settle all the details with. They were a big hit at our company holiday party! Wonderful A Cappella Group - Perfect for Any Ocassion! Absolutely fantastic performance that lasted the length that we discuss. Awesome communication throughout the entire show. They were fantastic throughout the entire performance in front of 300+ in attendance for our international event. Would 10/10 recommend them in any/all settings. Worth. Every. Single. Penny. Thank you so much! Eden was a pleasure to work with. So friendly, so accommodating, so smart!! And the performance was PERFECT!! We run a rather interactive holiday themed outdoor evening event closing off our main shopping district This is our 3rd event using The Belles they are a joy to work with as they interact successfully with ever age group. If you elect to utilize their charms and skill sets you will be more the delighted. THey will magically enhance any event. The Jingle Belles were a hit as they moved throughout several areas during cocktail hour! They were on time, professional & wore adorable dresses & hats. A great addition to our event. Book The NY Belles before they become famous!!! 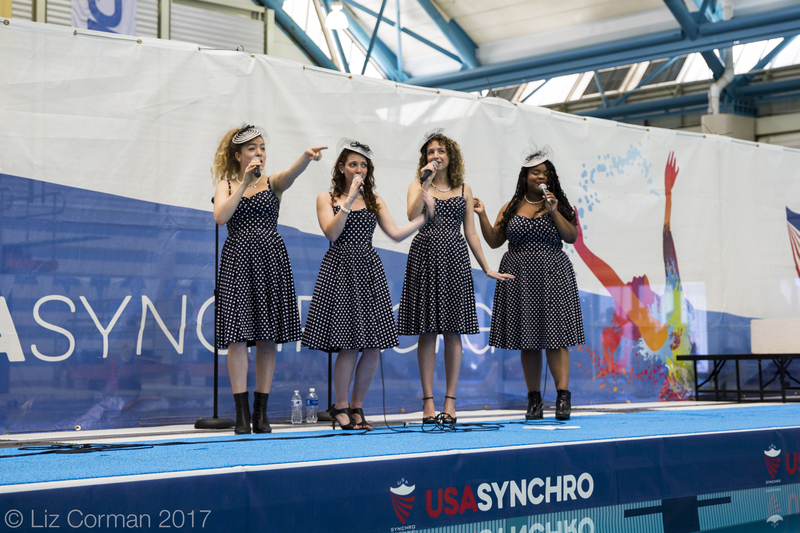 These talented singers exude positivity, happiness and good energy at any event. I hired The New York Belles for a corporate holiday party held at World Trade Center. The audience was comprised of employees, executives and clients; 3 different types of groups that was brought together by The New York Belles. As soon as they started singing, everyone became festive and more social! They are a delight and boy, can they sing!!! I foresee that they will be signed and famous one day. They are stars in the making for sure. We brought the Belles on for an outdoor, public holiday event. They were great to work with! Professional, they sound great, and they didn't mind when we had to make dramatic changes to the set list. They warned us in advance that they wouldn't be able to have their full team there -- but the performance didn't suffer one bit. We also asked them to make a few public service announcements, which they were great about as well. Really hoping to be able to work with them again. Amazing --- went to brunch and was so special. So freindly and want a treat to hear Christmas songs sung so well. I will look them up for a event I will be hosting soon. I simply can't recommend the girls enough, they are so talented, communicative, beautiful and easy to work with that I could't wish for more. We hired them to perform at our wedding ceremony and they made our event very special. I keep viewing our wedding video just to hear them singing again and again. :) And all the guests kept asking me where have I found them. Everything went according to the best case scenario from the moment I first emailed Eden till their last song at the ceremony. And during all the preparation process and the ceremony itself I felt more like I'm dealing with close friends who wished to perform at our special event then with hired professional - this is how friendly and nice Eden was to me. They even gave us a wedding gift! So if you are looking for someone special look no further. On August 9, 2015 one of my most important days happened. I proposed to my best friend. To make this moment special I hired this young and talented group to perform in rockafella center. It was to be a surprise so timing had to be perfect. This group from the moment I contacted them up to the moment was always in communication with me. Not only was their timing perfect but their voices were amazing. They had everyone in rockafella center stop to listen to them. I am very grateful for their services and will/would hire them again in the future. They are beautiful, talented and very easy to work with. I wish them the very best in their future. Thank you again for making this day perfect. The New York Belles helped me out with a surprise proposal. Eden got everything sorted out virtually overnight and helped to ensure that everything went smoothly on the Big Day. Thank you Eden, Lisa, & Ameerah! I jsut returned from a luncheon in Huntignton NY. The Jingle Belles were the entertainment. These girls are awsome! Hire them now before they get too famous. These ladies are going places!! Hi Marie! It was such a pleasure singing at the luncheon this afternoon. Thank you! Harmonies like you've never heard! We love to perform songs from different genres/decades to let all generations experience new music. Our repertoire consists of songs from the 1940s to current hit songs. We enjoy interacting with our audience and letting them request their favorite tune. We've enjoyed working with our venues year after year. The Jingle Belles started out at 7 years ago at Five Towns College. 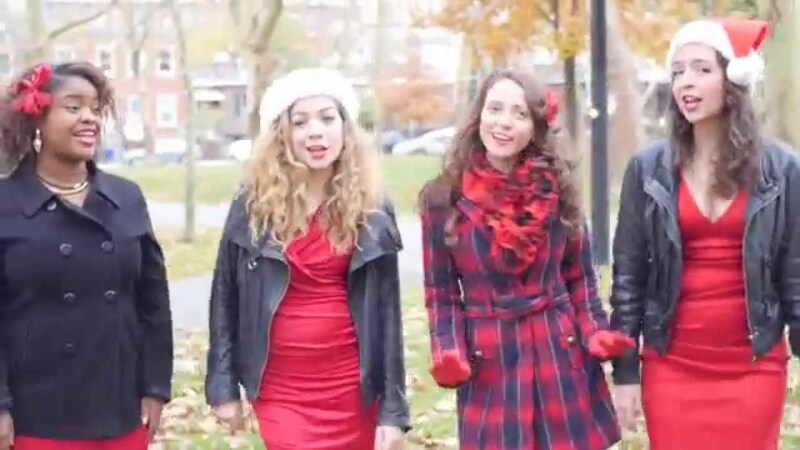 Samantha and Eden and two other friends from school formed The Jingle Belles. Our group has since evolved to include Renee (Eden's sister) and Ameerah (a killer singer we met 2 years ago via craigslist!) The four of us have become very close friends and we have a great blend as a group. Samantha is the pop star, Renee is the Indie songstress, Eden is the Broadway Babe and Ameerah is the rockstar diva! We started our act in restaurants and holiday parties on Long Island and now we perform all over the tri-state region. December 15, 2017 • 6:00pm - 9:00pm Garden City NY Public Event Main St.
We have a large repertoire of music and we are willing to perform your favorite song for an additional fee.